It is heartening to see young forces pondering traditional rock values, even citing blues legends such as Blind Lemon Jefferson and Willie McTell as their source of inspiration. Who dare do such thing you might ask? Scorpion Child unravels the answer. Of all the classic rock influences steaming here perhaps Led Zeppelin are the lecturers that stand out the most. Fondness for the former is resurrected through undiluted vim and vigour that the band brings to the songs. Aryn Jonathan Black’s powerfully yearning vocals owe a great deal to Robert Plant, and Christopher Jay Cowart's widescreen guitars manage to bridge the rather elusive chasm between denim robed rock n’ roll swagger and hazy rock. The meat of the album lies in straight up rockers such as “In the Arms of Ecstasy”, “Polygon of Eyes” and the crunchy “Paradigm”, which threatens to run right of the rails. The light relief comes with the rather puzzling epic “Red Blood (the River Flows) while “Liquor” continues to sways around in an intoxicating funky hard rock style, and “Antioch” is a sweetish, good enough ballad. There are a couple of dodgy moments. “Salvation Slave” and “the Secret Spot” both mysteriously lack traction song writing wise. 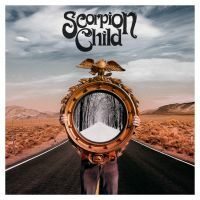 Nevertheless, potent dynamics and a fair due of solid, well executed material suggest Scorpion Child as a worthy opposition to the Answer.